Thursday March 30 1911 Sewed some today. I went to town at 3.15 did errands for an hour and went to the last of The Newton lectures on Robert Louis Stevenson. I got home at 5.40. Got supper and finished my pillow cases. A letter from L.D.L. 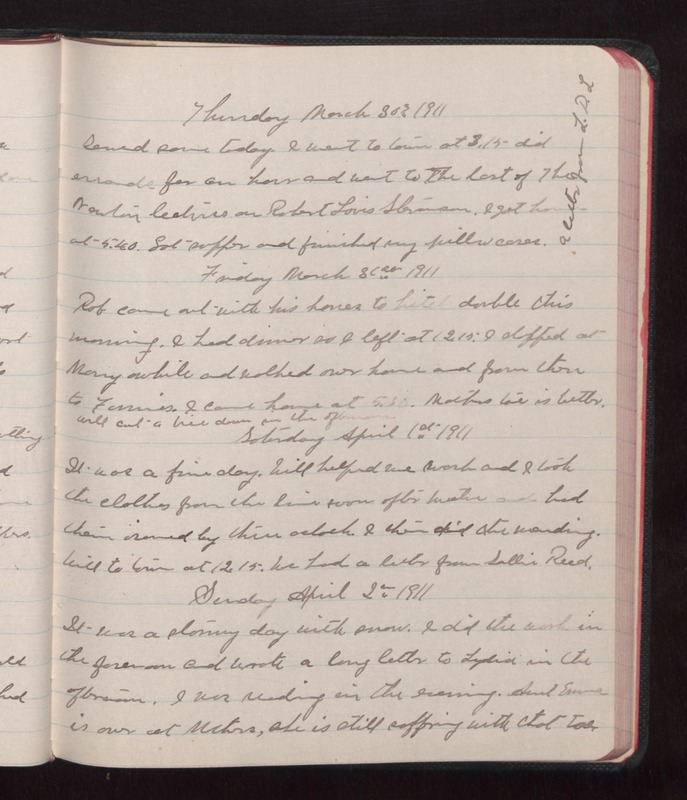 Friday March 31 1911 Rob came out with his horses to hitch double this morning. I had dinner so I left at 12.15. I stopped at Mary awhile and walked over home and from there to Fannies. I came home at 5.30. Mothers toe is better. Will cut a [illegible] down in the afternoon Saturday April 1st 1911 It was a fine day. Will helped me work and I took the clothes from the line soon after twelve and had then ironed by three oclock. I then did the mending. Will to town at 12.15. We had a letter from Sallie Reed. Sunday April 2 1911 It was a stormy day with snow. I did the work in the forenoon and wrote a long letter to Lydia in the afternoon. I was reading in the evening. Aunt Emma is over at Mothers, she is still suffering with that toe.